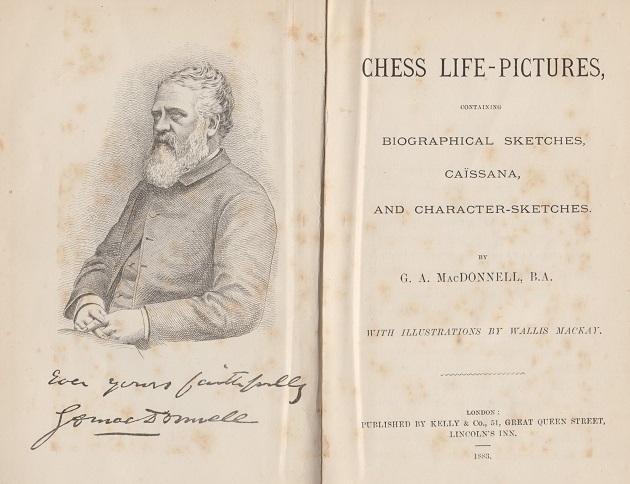 No picture of Alexander McDonnell has ever been found, but many chess luminaries have investigated and debated how Alexander McDonnell’s surname should be spelt, and here we review the discussion. 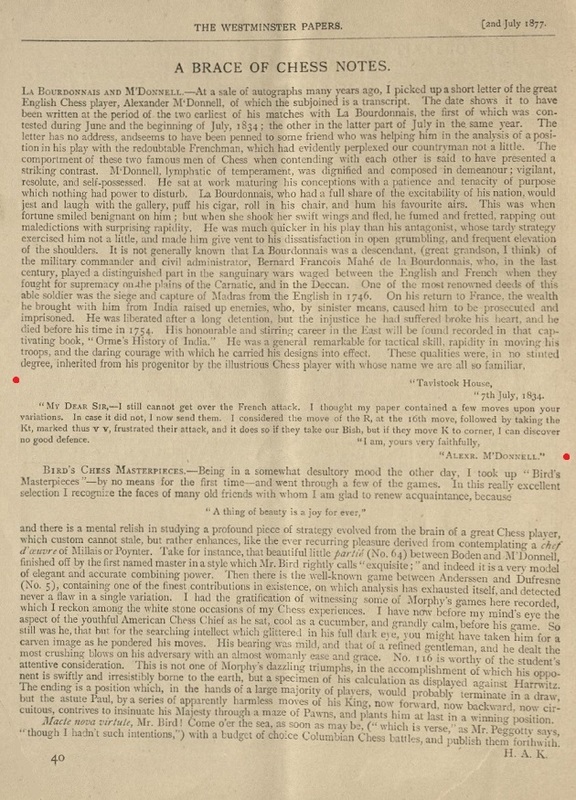 The above information was repeated in the Chess Monthly, November 1859, pages 357-358, with the same spelling Kensall (instead of Kensal) but without any mention of Harris or the Chronicle. When the 1846 Chronicle (pages 250-251) quoted a letter written by A.M. in 1834, it put McDonnell. The following volume (pages 362-363) gave two of his ‘unpublished games’, using the spelling M‘Donnell. 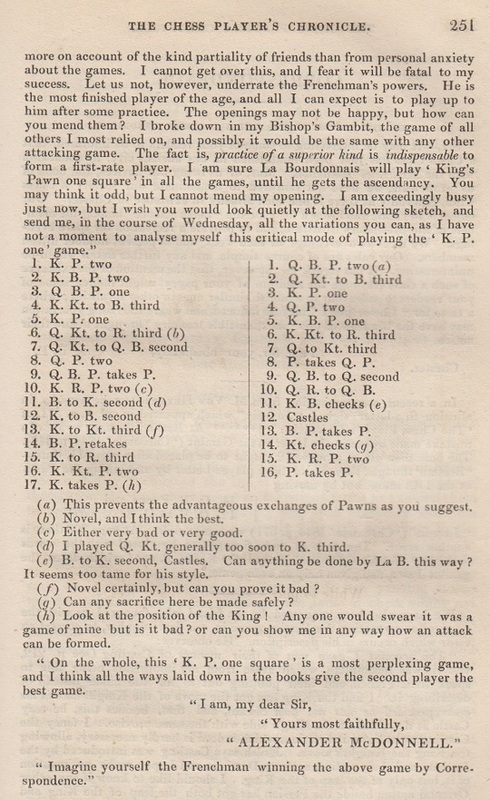 Two further letters from him were published, courtesy of George Walker, on pages 13-14 of the January 1860 Chess Monthly, both being signed ‘Alex. M’Donnell’. As shown above, within four years the Chess Player’s Chronicle had employed the spellings MacDonnell, McDonnell and M‘Donnell, and subsequent writers took their pick. In A History of Chess (Oxford, 1913) H.J.R. Murray gave MacDonnell, explaining in a footnote on page 880: ‘I follow the spelling of the name on MacDonnell’s tombstone at Kensal Green’. (As will be seen below, he later regretted the decision.) His posthumous book A Short History of Chess (Oxford, 1963 – but written in 1917 and updated by B. Goulding Brown and H. Golombek) had McDonnell. 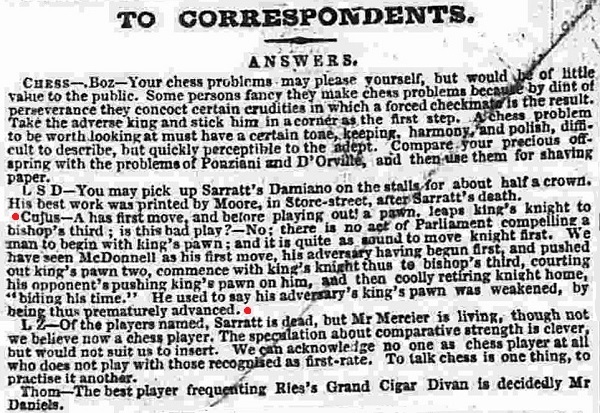 CHESS then quoted Hawks’ article, which repeated the Kensal Green inscriptions as given in the Chess Player’s Chronicle of 1843, but with MacDonnell now appearing as McDonnell. It might have been added that Bird also gave the wrong year of death (1837 instead of 1835). It will be noted that in the 1948 discussion nobody referred to ‘MacDonnell’ being reported as the tombstone spelling by William Harris in the early 1840s. 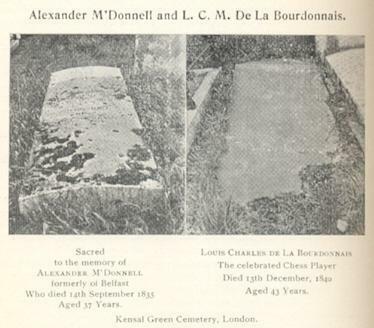 Detailed information about the location of the graves of both McDonnell and Labourdonnais was given by David Hooper on pages 514-515 of the November 1986 BCM. ‘Some problems have little or no practical importance but gradually accumulate human interest because many people tackle them and fail. When at last someone succeeds, it is something. Mount Everest. … The mystery has now been solved – and on the initiative of an Australian 12,000 miles from the scene of the crime. He is that indefatigable chess antiquary of Melbourne, Mr M.V. Anderson, possessor of the biggest chess library in the Antipodes. He appointed as local sleuth his nephew Mr E.J. 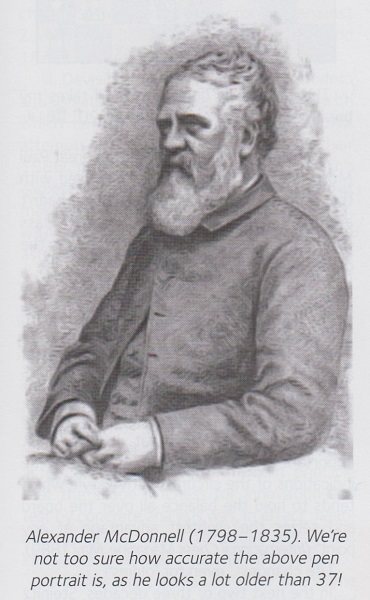 Watson, who proved much more efficient than any of the antiquaries who have tackled the problem before. Above all, he unearthed a signature – two, in fact. First of all, Mr Watson consulted – in the British Museum Library – the title-pages of all the books and pamphlets on political economy of which A.M. was the author. The titles are lengthy, and we content ourselves with listing the ways the author’s name is spelt, together with date of publication and the name of the publishers. The 1833 pamphlet (in the form of a letter) ends with the (printed) words, ‘Your obedient Servant, A. McDonnell’. This would more or less compel Messrs Effingham Wilson to use that spelling on the title page. That was 1825. Subsequently, the Minute Books of the West Indian Committee of Merchants, of which A.M. was secretary, showed the name as McDonnell but not in the form of a signature. 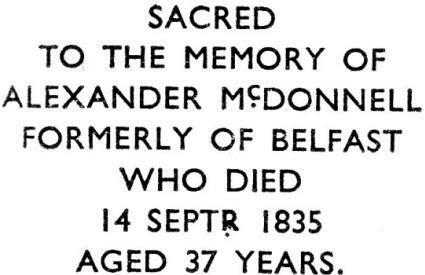 He died two weeks later, so it is fair to assume that whatever variant of his name he may have preferred at one time or another, he died Alexander McDonnell. There is no birth certificate, as civil registration of births in Ireland only began in 1864. In any case, a birth certificate is only conclusive for given names, in this case Alexander. Nobody is bound to spell his surname the way his father did, and it is rather the last spelling than the first that matters. ‘Since I was first able to spell my name (in the 1950s) I have considered M plus a small c (Mc) to be interchangeable with M plus an apostrophe (M’). A friend who has an excellent knowledge of the Ulster Scots heritage has confirmed that until probably about 50 years ago M’ was frequently used (particularly in print) to represent Mc. My cuttings of Belfast News-Letter chess columns from the 1930s to the 1950s suggest that it was the standard rendition. Today, M’ has fallen out of use. When I sign my name the small c is aligned with the top of the other letters, so that it actually looks quite like an apostrophe. I would therefore suggest that McDonnell and M’Donnell are in reality the same. MacDonnell, however, is a true variation in spelling. 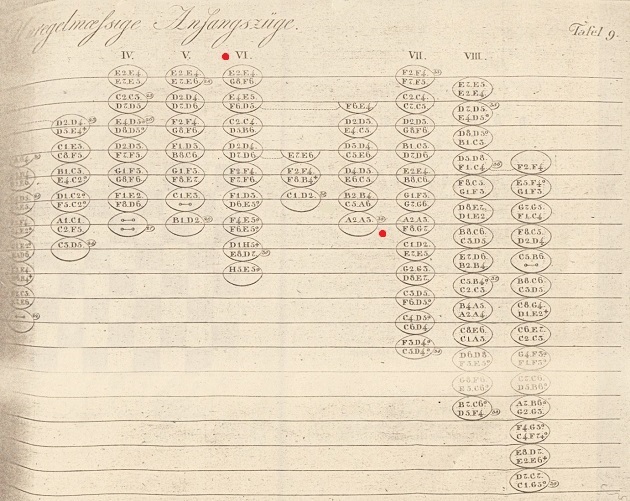 This commentary on the variation 1 e4 Nf6 2 e5 Ng8 suggests that McDonnell possessed some understanding of what we would now regard as hypermodern principles of play. The relevant notes (30, 31 and 32) can be read in the Google Books scan of the work, on page 108. The connection between Alexander McDonnell and hypermodernism is intriguing. Our correction was reported on page 43 of CHESS, November 2016.